From left: Billy Gartley, Laura Brown,Dennis McFarlane,, Tina Ogilvie and Gareth Jackson-Hunt with the audio guides. Visitors to Dundee can learn the story of the city’s history through an audio guide launched at the McManus museum. The tours at the McManus will cover the permanent galleries at the site. They will be available in six different languages to make them accessible for the growing number of foreign visitors to the city. Sinclair Aitken, chairman of Leisure & Culture Dundee, said: “The introduction of these audio guides will be useful for all visitors and provide an in-depth look at the story of Dundee and the McManus in a simple and seamless way. The tour starts in the Gothic Hall where the topic is, What is a Museum and Dundee’s designation as a UNESCO city. It also describes some of the city’s collections and their design connections. In the Landscapes and Lives galleries there is an introduction to several objects including a focus on the Picts and the Royal Arch. Next, visitors are taken to The Victoria gallery where they are guided through the highlights of the fine art collection. The tour then drops by the Dundee and World gallery where there is an overview of Dundee’s maritime history and its whaling collections. The audio guide trip finishes in the Making of Modern Dundee gallery where, among other things, there is a look at the jute, jam and journalism for which the city became famous. 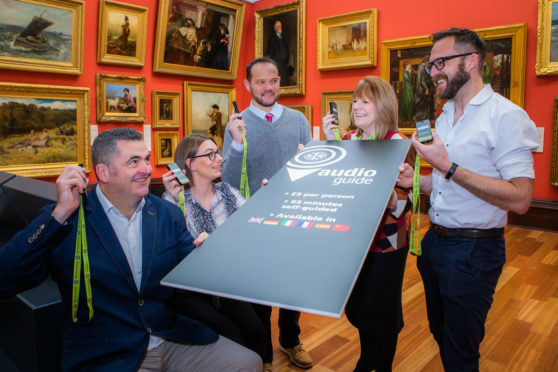 Caroline Warburton, VisitScotland regional leadership director, said: “It is fantastic news that even more visitors will be able to discover and learn about Dundee and the McManus through the arrival of these new audio guide tours. The handsets provide a guide to the museum in French, Spanish, German, Italian, Mandarin and English. The audio tours last for around one hour and cost £5 per visit, with the handsets available from the museum reception.